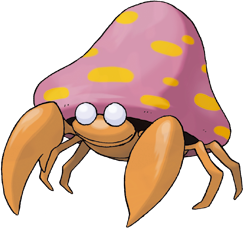 X A mushroom grown larger than the host’s body controls Parasect. It scatters poisonous spores. X Un champignon parasite plus gros que Parasect contrôle son corps. Il répand des spores empoisonnées. X Parasect está dominado por una seta parásita mayor que él. Dispersa esporas venenosas. X Parasect è controllato da un fungo ancora più grosso del suo corpo. Diffonde spore velenose. X 몸보다 큰 버섯이 파라섹트를 조종하고 있다. 독 포자를 여기저기 뿌린다. Y The larger the mushroom on its back grows, the stronger the mushroom spores it scatters. Y Plus le champignon sur son dos grandit, plus celui-ci émet des spores puissantes dans l’air. Y Cuanto más grande sea la seta de su lomo, más resistentes serán las esporas que esta suelta. Y Più cresce il fungo che ha sul dorso, più forti diventano le spore che sparge. Y 등의 버섯이 자랄수록 흩뿌려지는 버섯포자의 효과는 강력해진다. Omega Ruby Parasect is known to infest large trees en masse and drain nutrients from the lower trunk and roots. When an infested tree dies, they move onto another tree all at once. Omega Ruby Parasek sucht große Bäume heim und entzieht Nährstoffe aus Stamm und Wurzeln. Wenn ein befallener Baum stirbt, sucht es sich zusammen mit seinen Artgenossen einen neuen Wirt. Omega Ruby On sait que les Parasect vivent en groupe dans les grands arbres et se nourrissent des nutriments contenus dans le tronc et les racines. Lorsqu’un arbre infesté meurt, ils se précipitent vers le prochain. Omega Ruby Parasect es conocido por destruir en plaga grandes árboles, absorbiendo los nutrientes que tienen en la parte baja del tronco y las raíces. Cuando un árbol azotado por la plaga muere, los Parasect van a por el siguiente al instante. Omega Ruby I Parasect agiscono in gruppo e sono noti per la loro abilità di infestare gli alberi traendo nutrimento da tronchi e radici. Quando muore un albero infestato, ne cercano subito un altro. Omega Ruby 파라섹트는 집단으로 큰 나무의 밑동에 붙어 영양을 빨아들인다. 말라버리면 일제히 다른 나무로 이동한다. 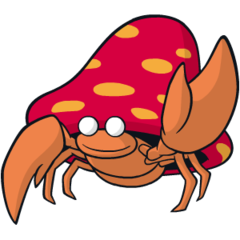 Alpha Sapphire Parasect is known to infest large trees en masse and drain nutrients from the lower trunk and roots. When an infested tree dies, they move onto another tree all at once. Alpha Sapphire Parasek sucht große Bäume heim und entzieht Nährstoffe aus Stamm und Wurzeln. Wenn ein befallener Baum stirbt, sucht es sich zusammen mit seinen Artgenossen einen neuen Wirt. Alpha Sapphire On sait que les Parasect vivent en groupe dans les grands arbres et se nourrissent des nutriments contenus dans le tronc et les racines. Lorsqu’un arbre infesté meurt, ils se précipitent vers le prochain. Alpha Sapphire Parasect es conocido por destruir en plaga grandes árboles, absorbiendo los nutrientes que tienen en la parte baja del tronco y las raíces. Cuando un árbol azotado por la plaga muere, los Parasect van a por el siguiente al instante. Alpha Sapphire I Parasect agiscono in gruppo e sono noti per la loro abilità di infestare gli alberi traendo nutrimento da tronchi e radici. Quando muore un albero infestato, ne cercano subito un altro. Alpha Sapphire 파라섹트는 집단으로 큰 나무의 밑동에 붙어 영양을 빨아들인다. 말라버리면 일제히 다른 나무로 이동한다. Sun The large mushroom on its back controls it. It often fights over territory with Shiinotic. Moon It scatters toxic spores from its mushroom cap. Once harvested, these spores can be steeped and boiled down to prepare herbal medicines. Red A host-parasite pair in the which the parasite mushroom has taken over the host bug. Prefers damp places. Blue A host-parasite pair in the which the parasite mushroom has taken over the host bug. Prefers damp places. Yellow The bug host is drained of energy by the mushrooms on its back. They appear to do all the thinking. Stadium The bug host is controlled by the mushrooms that scatter poisonous spores. The spores are sometimes used as medicine in China. Gold It stays mostly in dark, damp places, the preference not of the bug, but of the big mushrooms on its back. Silver The larger the mushroom on its back grows, the stronger the mushroom spores it scatters. Crystal When nothing's left to extract from the bug, the mushrooms on its back leave spores on the bug's egg. Stadium2 It stays mostly in dark, damp places, the preference not of the bug, but of the big mushrooms on its back. Ruby Parasect is known to infest large trees en masse and drain nutrients from the lower trunk and roots. When an infested tree dies, they move onto another tree all at once. Sapphire PARASECT is known to infest large trees en masse and drain nutrients from the lower trunk and roots. When an infested tree dies, they move onto another tree all at once. Emerald PARASECT are known to infest the roots of large trees en masse and drain nutrients. When an infested tree dies, they move onto another tree all at once. Pearl It is controlled by a mushroom grown larger than the bug body. It is said to prefer damp places. Platinum A mushroom grown larger than the host's body controls Parasect. It scatters poisonous spores. Black A mushroom grown larger than the host's body controls Parasect. It scatters poisonous spores. White A mushroom grown larger than the host's body controls Parasect. It scatters poisonous spores. Black 2 A mushroom grown larger than the host’s body controls Parasect. It scatters poisonous spores. White 2 A mushroom grown larger than the host’s body controls Parasect. It scatters poisonous spores.